Australia should consider adopting a four-day working week or a six-hour working day, a political leader says. 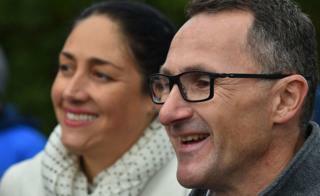 Richard Di Natale, head of the left-wing Australian Greens, argues reducing hours would boost productivity and allow workers more time with family. Mr Di Natale said he was not suggesting a specific model, but workers would need to be guaranteed adequate income. Australia's two major parties have not commented on the proposal, but it has drawn criticism from an economist. Should people be off on Fridays? In the dark days of the 19th Century, many workers in industrialised nations considered themselves lucky if they got Sunday off. The achievement of a 40-hour week with Saturday and Sunday off for many was a major landmark for the labour movement. But some have tried to go further. In 2008, about 17,000 government officials in the US state of Utah started working four 10-hour days in a bid to cut costs. The experiment didn't last: the five-day week was reinstated in 2011. Other US states have also toyed with the idea. The Gambia recently scrapped its four-day working week, which had been designed to allow people more flexibility on Fridays. But what is the ideal working week, and could the four-day week become more widespread? Mr Di Natale said he wanted to start a national conversation on the future of work. "It's time we recognised there are big questions we're not asking ourselves. What sort of society do we want to be?" he told the Australian Broadcasting Corp (ABC). "We have some many people in this country who are working more hours than they should." He said Australia could follow other countries in trialling a social security safety net to guarantee adequate income. Economist Saul Eslake said he did not support the proposal, comparing it to France's 35-hour working week. "The French are good at many things, but economic management is not one of them," he told the ABC. "Their economy has grown at barely more than 1% per annum over the past seven years."